Two gentlemen of fortune from the times of Imperial Russia are looking for the uncountable treasure at the dawn of Soviet Union age. A man with imagination opposes a society without it. Society forces him to betray his freedom-loving spirit, but imagination is immortal. Ostap Bender: [speaking to Kozlevich] I can't buy you a car. The government demands to know where I got the money from. 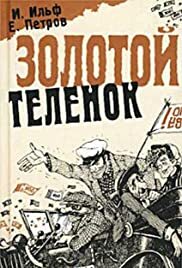 The version I watched not long ago of Ilf and Petrov's previous novel of Ostap Bender, "The Twelve Chairs" distinguished itself by unashamedly combining a 1920s setting with a 1970s look and feel. This film goes a very different route with no less success and goes all out for a reconstruction of the film style of the 1920s, complete with authentic-looking title cards to set the scenes. Combined with its sound (and excellent 1920s music) and accommodating running time, it makes for an unusual, pleasant and suitable feel. This film's greatest advantage is that it is completely in the spirit of Ilf and Petrov's hilarious, adventurous, subversive, and even somewhat humanizing novel. The book builds its effect on may small incidents, and it would have seemed a challenge to choose which to include even in a two-part film adaptation, but this one makes these choices seem perfectly natural. The biggest asset of them all is Sergey Yurskiy, who for me now embodies the hero Ostap Bender. He's a con man you can feel for (He just wants to go to Rio De Jinero! ), and his wry, knowing looks and addresses at the camera are, funny, effective at building sympathy, and at the same time as they are a tribute to the time of such artists as Oliver Hardy and Charley Chase, they also add a postmodern touch. If this adaptation is not as much fun as is source material, it is only for taking less time to finish!